I decided to get brave tonight and attempt a “Clam Stew with Potatoes and Parsley Puree” in Mark Bittman’s “Quick and Easy Recipes from The New York Times.” (A Christmas present.) I had been eyeing a bag of frozen clams in my folks’ freezer for awhile, and since I was cooking with my mom tonight I figured she could fix any disaster. Let me start by saying I’m not all that comfortable with shellfish. I kind of understand how to prepare mussels with white wine, but beyond that I’m pretty hopeless. 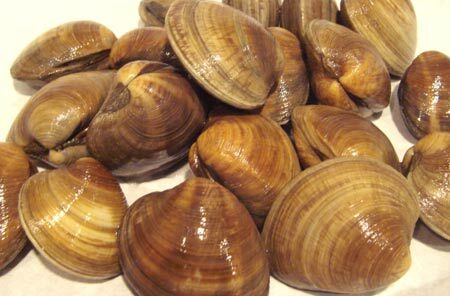 At any rate, I’m not going to be attempting anything clam-related anytime soon. While the recipe did turn out in the end as described in the book, it wasn’t withough significant additional flavours including sage, chili pepper, chicken broth, cream and extra olive oil and garlic. It’s still amazing to me how an experienced cook knows exactly what flavours work with which main ingredient. I think I went wrong off the top when trying to figure out how much of the clams to use. The recipe calls for 4 pounds of clams, but in retrospect I think this means including the shells, not the already cleaned ones I was using that come out of the freezer or a can. I think this is a shortfall of many cookbooks. They’re not detailed enough when it comes to ingredients, or using substitutions if the fresh product isn’t available. It’s not a criticism of this book in particular, (I’ll have to try a few more recipes before I draw any conclusions) but an observation from someone who owns far too many cookbooks. So, long story short, I’m going to lay off the ingredients that are a little out of my league, unless I’m working with someone with far more experience than I. Sea food creeps me out. Fish are aliens, as far as I’m concerned. Fish are no more aliens than the strange creatures that walk the earth. As far as I can tell an udder is no stranger than a fin. What about sushi anyway?